We have not seen much change in the appearance of the windmill over the summer. We needed to gain further Listed Building Consent for work on the tail and for handrails on the stairway. We also had to await the availability of our millwright, Bill Griffiths – a very busy man, as befits such a brilliant professional – but now we are on the final push. Bill and his assistant, Klaine, will be dismantling the tail assembly during the first week in November. They will take the bottom carriage away to be rebuilt in their workshop over the winter months. We will, however, be looking for volunteers to help with repair and repainting of the superstructure so if you’ve joinery or painting skills we’d love to hear from you. Please contact dm@greatchishillwindmill.com. When the millwrights return in February, they will rebuild the tail including a new fan that will drive the windmill to face the wind and we will complete the track on which the carriage will run. The stairway will also be repaired and have handrails fitted. Finally, in Spring, repairs will be made to the sail stocks (those large arms that you see at the moment) and the sail frames will be re-fitted. 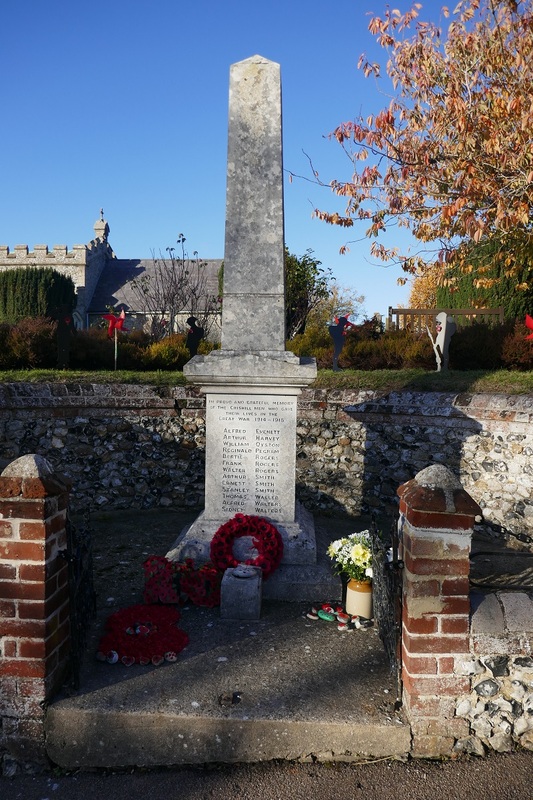 On Sunday 11th November the bells of St Swithuns rang out in remembrance of those from our villages who gave their lives in the 2 World Wars and in commemoration of 100 years since the end of the First World War. 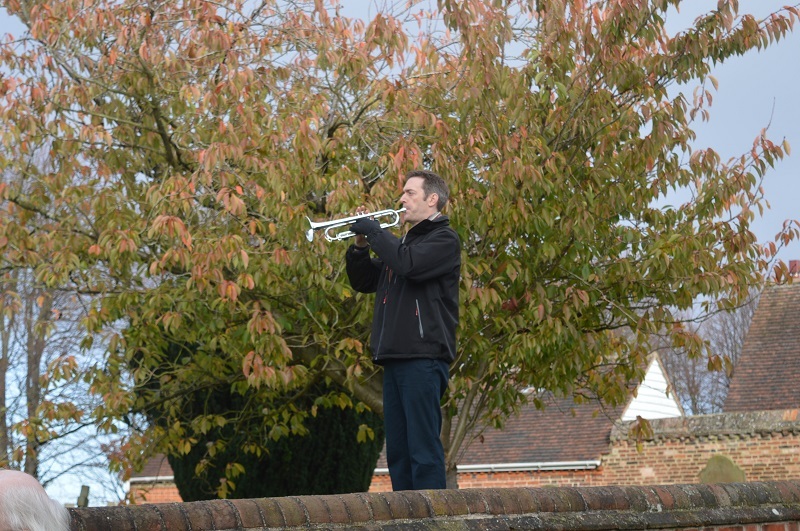 Firstly they rang half muffled - an eerie sound (as per tradition on the occasion of the war memorial service). Then at 1230 the bells will were rung again joining with thousands of other bells ringing all over the country at the same time. This was part of the national marking of the end of the First World War. Some more of Great Chishill bellringers rang the bells at Heydon for this too. In the evening the bells will rang again, this time at Great Chishill and Chrishall as part of the 'Battles O'er' Commemoration. 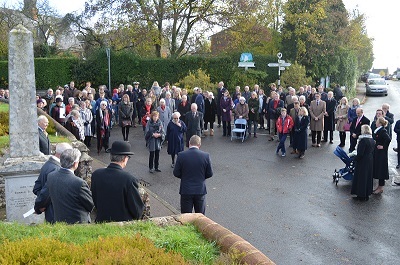 The gathering at the war memorial was the biggest that has been seen in the village for many years. 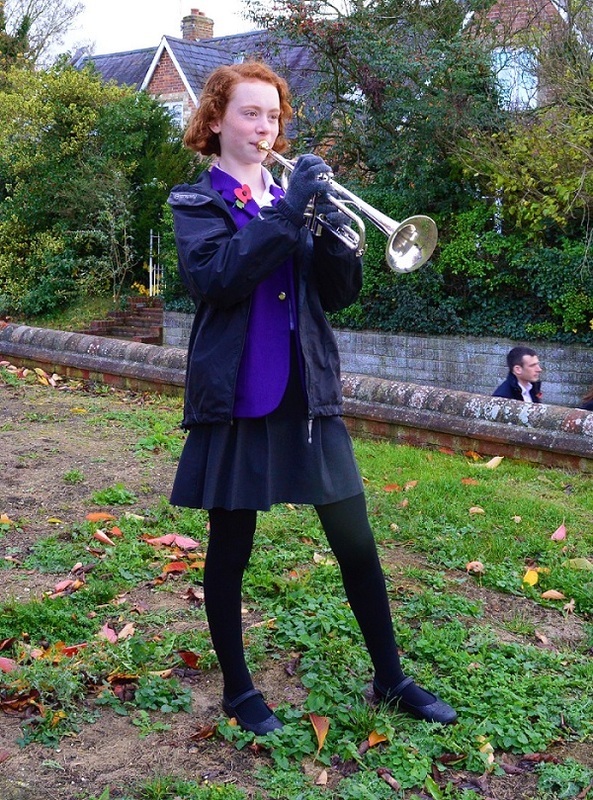 The service was conducted by Rev Simon Hall from King's College School, and the 'Last Post' and 'Reveille' bugle calls were performed by a young lady from the same school. 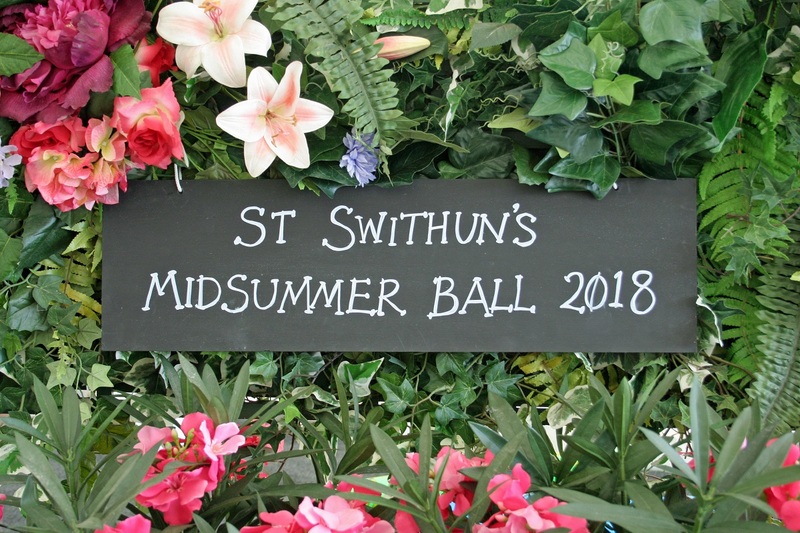 Saturday 16th June saw the return of Great Chishill's Midsummer Ball, raising money for St Swithun's Church. Months of what must have been very hard work by the organising committee culminated in a truly spectacular event, enjoyed by 250 friends and neighbours on a beautiful sunny evening. 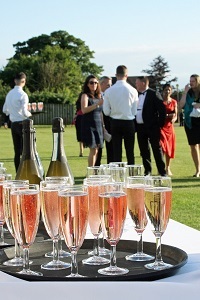 Taking full advantage of the weather, welcome drinks were served on the playing fields as the guests arrived in an array of stunning black tie outfits – it turns out that we all scrub up rather well! The party continued as we sat down to a delicious meal in the marquee adorned with fabulous tropical flowers, fruit and flamingoes. There was plenty more fun (and importantly, fund-raising) between courses with games, raffles and an auction of promises all featuring great prizes. Having already eaten more than might seem prudent in our highly tailored outfits we then discovered the cheese and sweetie carts which were the perfect after-dinner treat. After posing for some quick pictures at the photo booth, live music from the wonderful band “Fred's House” lured us on to the dance floor where an energetic crowd remained until 2am! Emily Hanson was there with her camera - click on the centre picture below to see the pictures taken in the 'photo booth' on the night and here to see other photos from the ball. 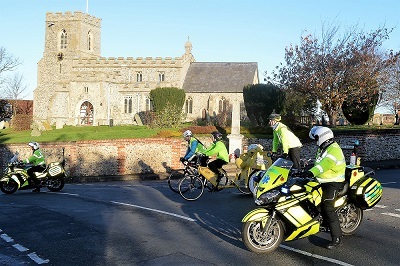 Heydon Road was completely closed outside the church in order to facilitate the connection of water and sewerage services to the church. As this picture shows (click on it for a better view), this entailed digging a very big hole - 11 feet deep when this picture was taken, and still not got to the sewer. Unfortunately for anyone wanting to get from one side to the other there was a very long diversion (about 5 miles), either via Heydon and Chrishall or New Road and Barley. The road has now re-opened and the church will be able to benefit from water and toilets for the first time in its very long history, thanks to the huge effort that has gone into fund raising. 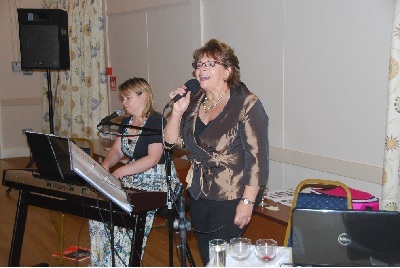 Friday 20th April was the date of another popular fund raising event, helping to further the St Swithuns restoration. The wonderful Cambridge University Ceilidh band had no problems in getting people up on to the dance floor in the village hall on a beautiful warm, spring evening. Supper was provided by the ladies of the village - Coronation Chicken and rice, and chocolate brownies. Altogether a very successful evening - thank you to everyone involved. Watch this space to find out how much was raised. 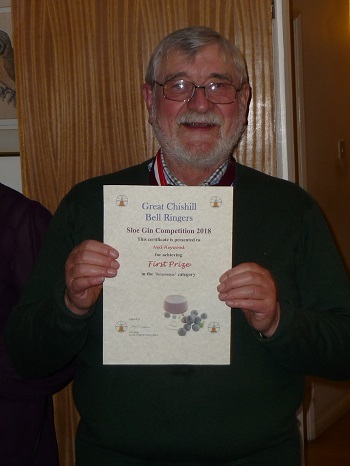 The annual Great Chishill Bell Ringers Sloe Gin Competition took place on 22nd February with the party and prize giving two days later. 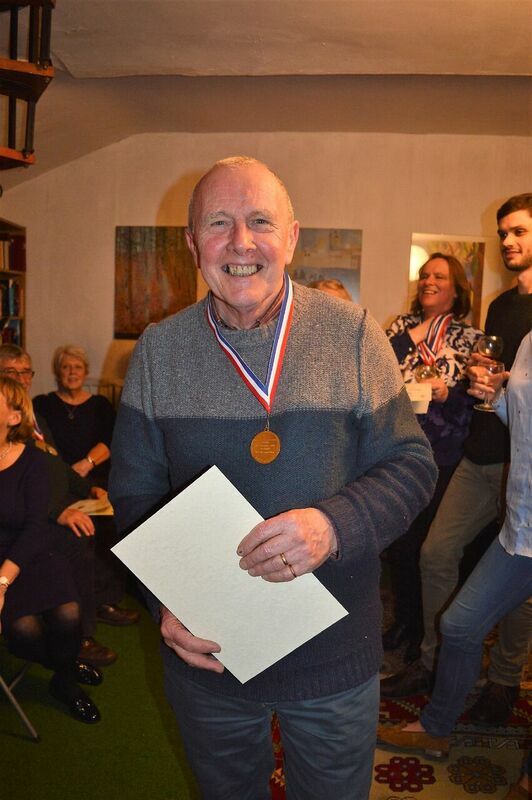 Neil Heywood not only hosted the party but was pleased to find himself presented with 1st prize in the 'Nouveau' category, and 3rd prize in the 'Vintage' category. Other winners were, in the 'Nouveau' category, 2nd Roger Truett and 3rd Peter Wiseman. Ian Sanders from Barley came first in the 'Vintage' category, with Ivan Sharpe second. 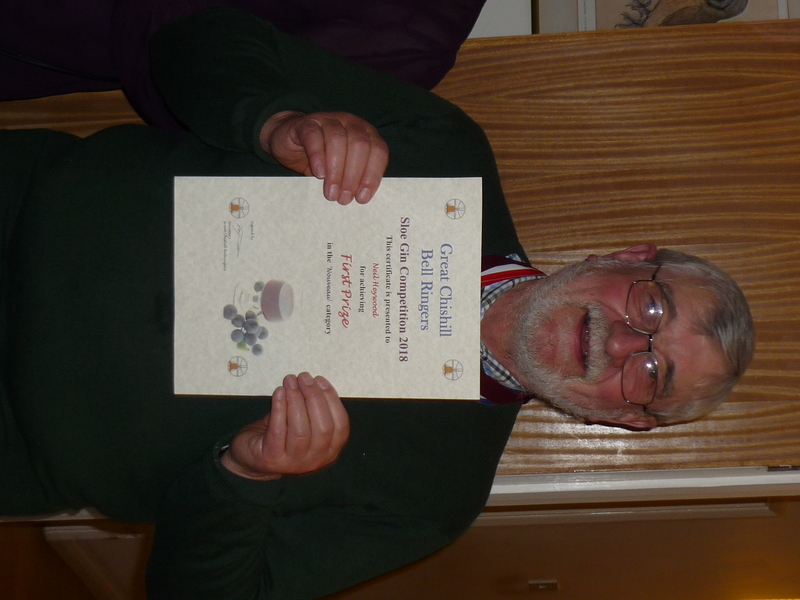 In the 'Ringers Delight' category, Geoff Miles was first with his Damson Brandy, Stella Russell second with her Damson Gin, and Ivan Sharpe came third with his Quince Liqueur. Elaine Knobel -Forbes won the 'Presentation' medal. Altogether there were about 60 entries, raising £313 towards the bell fund. 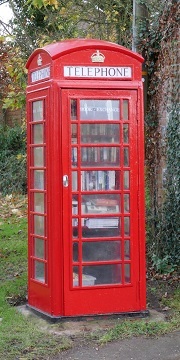 Great Chishill's only telephone box - A Grade II Listed Building (Yes really!) - has been renovated. 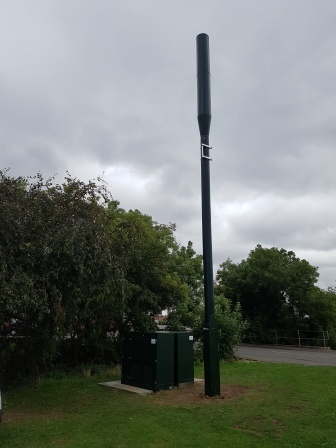 BT removed the telephone facility a couple of years ago, but the Livings family have given it a complete makeover as a memorial to Mike Livings, a Great Chishill resident for over 40 years, who passed away in February 2017. The family have repainted it in the proper red colour with the crown picked out in gold. Inside they have put shelves and stocked it with books. The idea is that residents can use it as a book exchange, swapping books as and when they feel like it, for no cost at all. A big thank you to the Livings' for turning what had become an eyesore into something to be proud of. 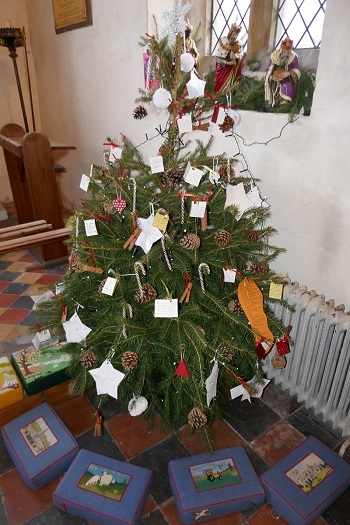 Saturday and Sunday, 9th and 10th December saw the first Great Chishill Christmas Tree Festival, held in and in aid of St Swithun's Church. 25 Christmas trees had been decorated, each by a different group from the village, and a considerable amount of effort had obviously been put into each one. Lots of people turned out to enjoy them despite the snow fall on the Sunday. On Thursday 7th December the senior members of our community gathered in Great Chishill Village Hall for their annual Christmas Tea Party sponsored by the Parish Council. Neil was there with his camera and the photos (click here to go to the Photo Album) show that a great time was had by all, with lovely food, some great chats and quite a lot of laughing! Thank you to everyone involved in making it such a great success again, and to the Parish Council for paying for it. 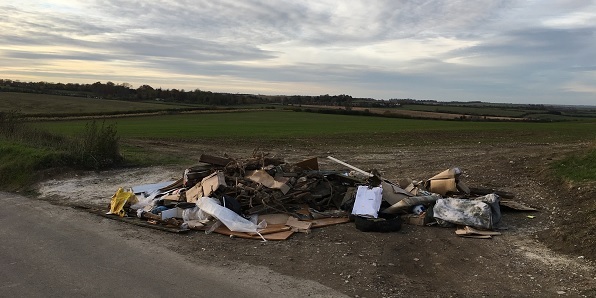 Fly Tipping - again and again! 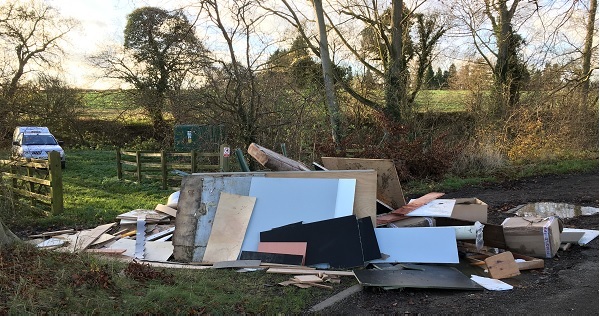 There has been more incidents of Fly Tipping in our area. The pictures below show a mix of builder's and household rubbish down May Street and Little Chishill Lane. It is sickening to think that there are people who do this and even more so when they despoil our lovely countryside. 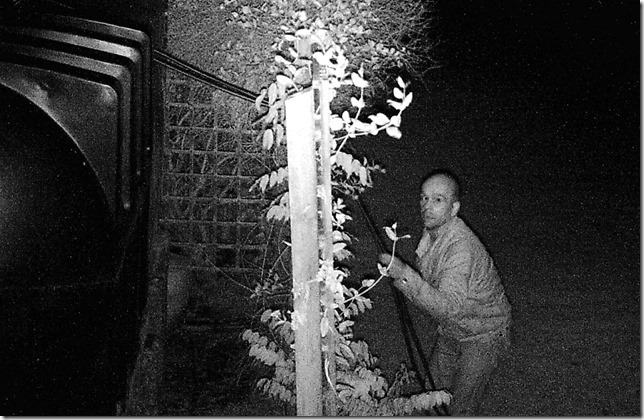 Some GOOD NEWS however - it appears that one of the perpetrators was recently caught red handed and the police involved! On Saturday 14th October Professor Carenza Lewis talked to an enthralled audience about the history and archaeology of Great Chishill. Carenza Lewis has appeared on many popular TV programmes on history and archaeology, and she ably showed her talent for bringing the past to life. 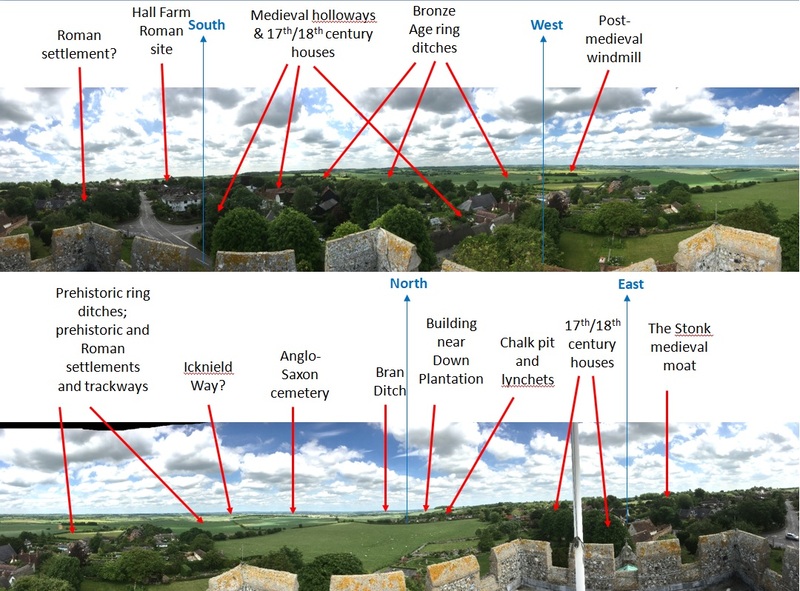 Taking a panorama from the top of St Swithun’s tower as her starting point, she led us through a fascinating journey of discovery covering the Icknield Way, the prehistoric landscape – with aerial photos showing evidence of Neolithic enclosures all around the village. 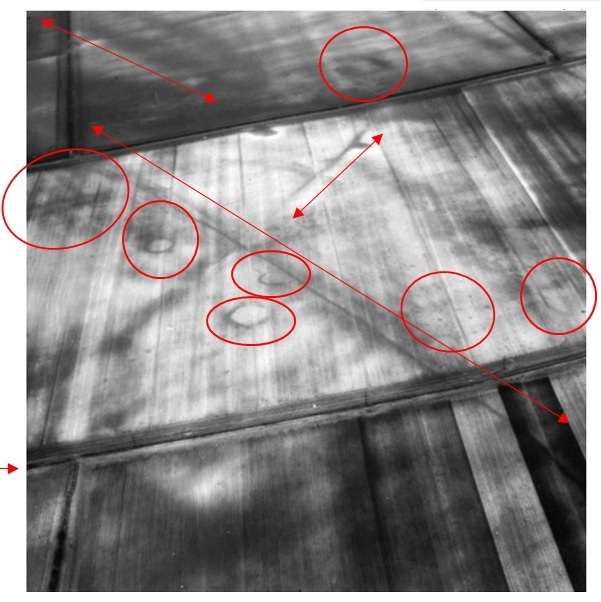 She told us about the discovery of a nearby Anglo-Saxon cemetery, where it seemed the victims had been decapitated!, a massive defensive system across Cambridgeshire, of which Bran Ditch (running from Heydon to Fowlmere) forms a part together with Devil’s Dyke and Fleam Dyke. She painted a vivid picture of Great Chishill as a village on the borders, between the wooded hills in the south and the marshy lowlands, and of the nuclear villages to the north and the dispersed villages to the south. She told us about the development of the village, The Stonk, a medieval moated manor, holloways, strip lynchets, lost fields and much more. It was a wonderful evening, and following the talk there was a lively question and answer session, with everyone enjoying drinks and nibbles. This event celebrated the start of our Heritage Lottery Fund project, to repair the church tower and provide new facilities. 24th September 2017 saw Vyckie and myself (Tracey) take on the Berlin Marathon for the breast cancer charity Walk the Walk. We had a fabulous weekend with our team and have already raised £2000 this year so far. We did it in our bras to raise awareness of the charity - we took on the challenge #beatberlin42 and did! 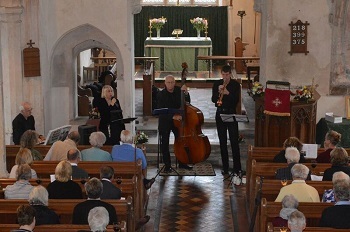 Yet another St Swithun’s restoration fundraising event took place in the church on 22 July with a recital by Skylark, a group founded by singer Jude Short and keyboard player Roger Lilley. Skylark have been entertaining audiences for 20 years, supplemented more recently by Ondrej Cais (trumpet) and Mike Lewis (double bass). Their style could be called bar jazz – cool, smoky, and intimate. Skylark’s repertoire is wide, American song book standards, tango, bossa nova, and even two songs by Jaroslav Ježek, aka Czechoslovakia’s Gershwin. Many songs were arranged by Roger Lilley to showcase Jude’s clear soprano and Andrej’s cool, usually muted trumpet, two voices which blended happily together in many of the numbers. Latin America is a profitable hunting ground for the group, with songs from Uruguay and Argentina featuring among the more familiar Brazilian numbers. The Czech songs added a further note of the unfamiliar; everyone knows ‘Summertime’ but it’s a fair bet that this was the first time ‘Ze dne na den’ was heard in Chishill! 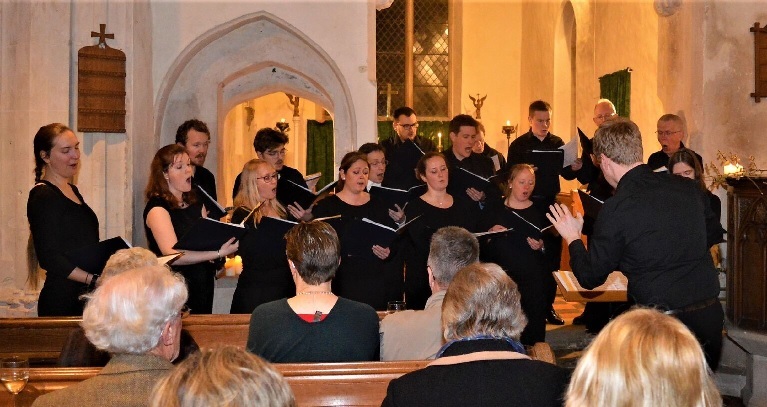 Skylark give their time freely, so the community owes them a huge vote of thanks - the evening raised a splendid £800 towards the restoration of St Swithun’s, according to the concert’s organiser Angus Gent. At a service in Chrishall church on 26th July, led by the Bishop of Chelmsford, the Rt Revd Stephen Cottrell and the Archdeacon of Stansted, The Venerable Robin King, The Revd Dr Anand Sodadasi was installed as Rector of The Parish of The Icknield Way Villages. Anand and his wife Shailaja come from Andhra Pradesh, South India, where they trained theologically and worked for 12 years as full time ministers. Anand was ordained as a priest in his Indian diocese in 2001 and both taught in a theological college for 5 years, training the ordinands. Anand went to Oxford in 2004 to do a Ph.D and the family joined him soon after. He worked as a Duty Priest in the Diocese of Oxford, while the children Stephen and Serena completed secondary schooling. 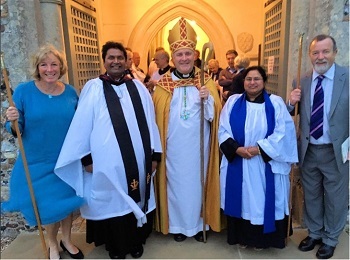 Then they moved to the Borderlink Parishes, Hereford where Anand has been Rector for 7 years. Shailaja trained as a dispenser and worked in a pharmacy, while volunteering in the chaplaincy department of Hereford Hospital before being licensed as a Reader for the Borderlink Parishes. The Annual Sloe Gin Competition (the oldest one in Britain) judging took place on 23rd February into the early hours of Friday morning, and the party and prizes ceremony took place on Saturday 25th February. After much consideration and extensive tastings, some of the usual people won prizes (Stella Russell carried off 3) but it was good to see new names in the winners list. We're looking for volunteers to help us produce a more interesting leaflet interpreting the history and heritage of the church, as part of our heritage lottery funded project to repair the tower. It doesn't have to be just about the church fabric, it could include the bells, the war memorial, the churchyard, were there any interesting vicars? etc. etc. The picture on the left shows the church tower after it collapsed at the west end - more information required! 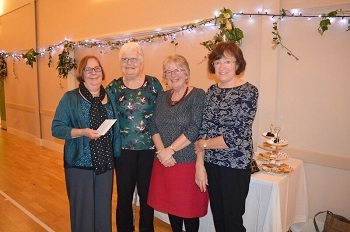 The Chishills' senior members celebrated Christmas on 15th December in the village hall with a wonderful tea funded by the Parish Council and organised by the team of ladies shown here (Liz Parkes, Janet Crouch , Eileen Murrell and Sue Price). Neil Heywood was there with his camera and he took lots of pictures which can be seen by clicking here or clicking on the 'Photo Album' tab above. and our Young People Celebrated too.. 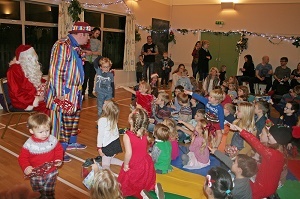 The Great Chishill and Heydon Children's Party was held in the Village Hall on 11th December. More han 50 children and the families were entertained by the marvellous Stripey Wipey. Father Christmas interrupted his very busy schedule to fly in specially! Thank you Father Christmas. The Youth Club enjoyed a Disco & Pizza night on their final club of the year - with DJ Simon supplying his brilliant music. Instead of party treats, the young people made donations of food for the Hitchin based homeless hostel ‘North Herts Sanctuary’. As a result Dan was able to deliver a large box full of food to this worthwhile cause. 'Rickshaw Challenge' in Great Chishill On 18th November the One Show’s 'Rickshaw Challenge' did its final leg of the 470-mile journey from the Scottish market town of Jedburgh to central London, all to raise money for 'BBC Children in Need'. On this last day, their route from Duxford took them through Chrishall Grange, Heydon, Great Chishill, Shaftenhoe End and Barkway. 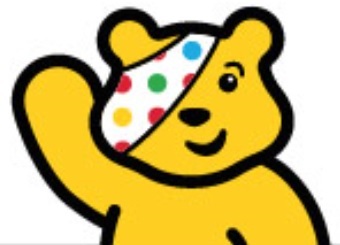 The rickshaw was pedalled by six young riders, all of whom have been supported by 'BBC Children in Need' funded projects. The One Show presenter Matt Baker was on the road cycling alongside the team offering support and advice throughout the journey. Photos © Neil Heywood Click on picture for larger version. 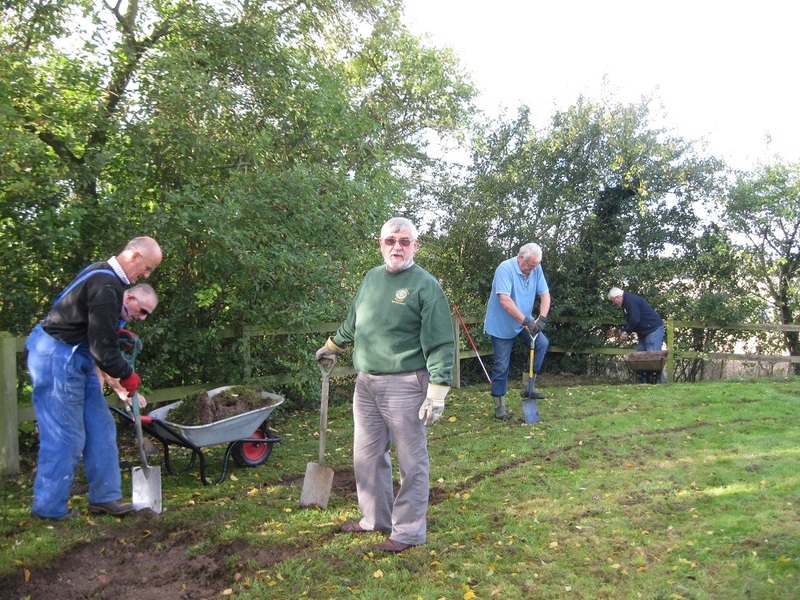 A team of Rotary Club volunteers, from Saffron Walden and Royston, cut turves at the windmill site on 17th October marking the start of restoration of the landmark. 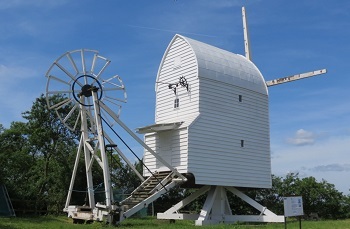 The main aim of the Great Chishill Windmill Trust is to preserve the mill in a stable and weather-proof condition for future generations to enjoy. A second phase seeks to make it fit to turn into the wind to allow the restoration of the sails without risk of overstressing the structure. 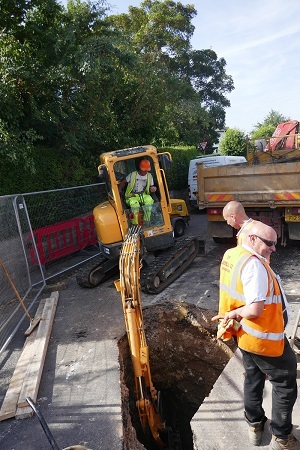 Whilst permission must be gained for work on the Grade II listed building itself, the committee decided to start visible work on the site by uncovering the fantail track. This is the circular track on which the tail assembly wheels travelled as the mill turned into wind around its central post. 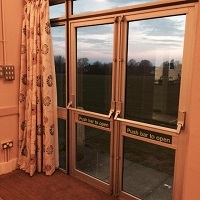 David Telford, President of the Saffron Walden Rotary Club said: “We were happy to help out on such a lovely day with a glorious view and passing interests. Hopefully the exposure of the tail track will add momentum to the restoration project.” Everyone greatly appreciates their splendid work which has brought us a step closer to seeing this icon move with a purpose once more. 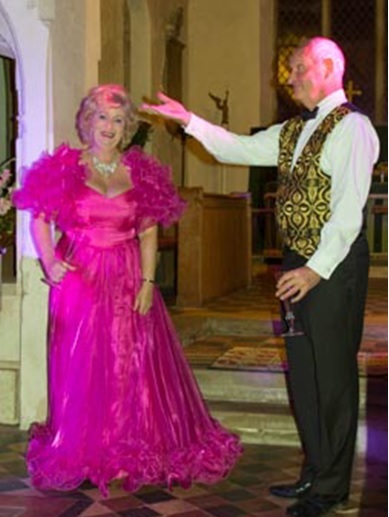 St Swithun’s Church was pretty in pink for the second week of October, bathed in pink lights to herald operetta trio ‘Pink Champagne’s lively evening of song, laughter and audience participation for St Swithun’s Appeal Fund. Together with our sponsor’s Pinkster gin (and tonic) from Barley, pink champagne and pink-themed canapés the audience of 100 settled down to enjoy a programme ranging from the ‘Champagne Trio’ from Strauss’s Die Fledermaus to an Ivor Novello tribute and extracts from Lehar’s Merry Widow. With a well supported raffle, the £950 raised takes the Appeal Fund over its initial target of £50,000 in two years! The Appeal Committee extends a huge thank you to all who have supported events over the last 2 years. 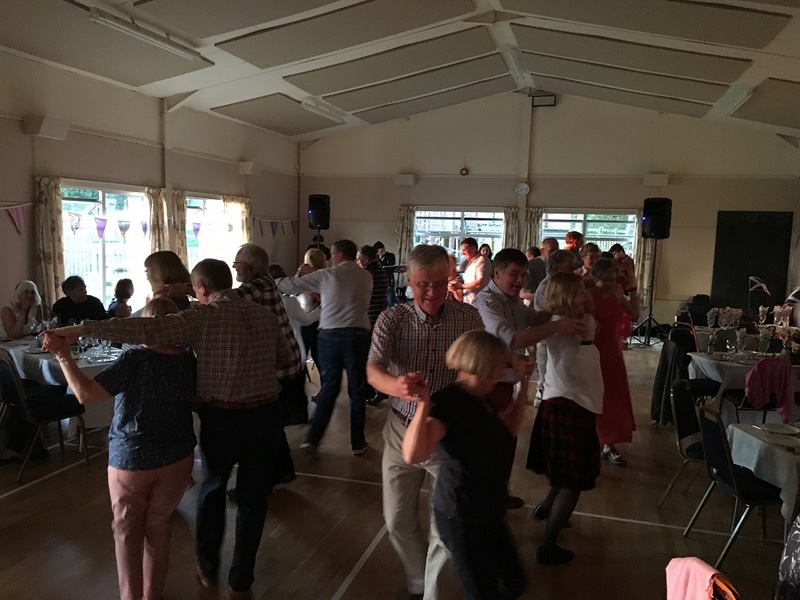 Last year, Wendy and David McKeown organised dance lessons for absolute beginners with all proceeds being donated to the Great Chishill Windmill Trust. This was a great success and £1000 was added to the fund. The original dancers persuaded Wendy and David to run more lessons through the Autumn and Winter. 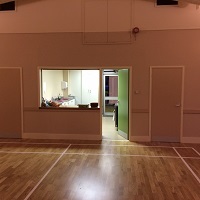 They are held in Great Chishill Village Hall at 7.30 to 8.30 on Friday evenings. 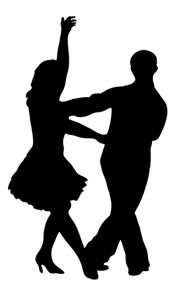 So, if you have done a little ballroom and Latin dancing but would like a refresher, please contact David at mckeown.david@gmail.com. If you are an absolute beginner, still get in touch as we have a gentle pace of learning so that anyone with rhythm shouldn’t find catching up too difficult. These are fun sessions with emphasis on enjoyment – we are not after medal performance, just to be able to get around the floor with confidence. Victorious Season for GC Cricket Club! 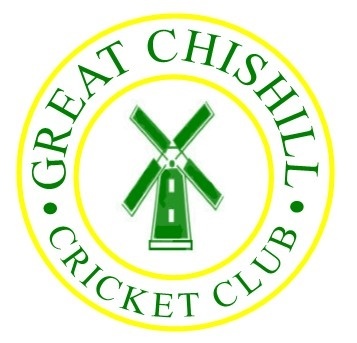 The Great Chishill Cricket Club season came to a close with promotion into the Senior League Division 3, for only the second time in its history!! Winning the penultimate game with authority and dominance against promotion rivals Wilbraham’s. Sadly the final game of the season was rained off at the half way stage, the only rain loss of the season. As a club 31 different players have been chosen to represent the side over the 18 games that were played. At the close of the season the club had the second leading wicket taker with 29 wickets, the highest run scorer with 764 runs, the top fielder (wicket keeper) with 24 dismissals and greatest not out batsman in the league with 8 not outs, not too bad for a small village team, beating Royston on all counts! Indoor nets will be running in the New Year, so don’t forget to dust off your kit then! New members are always welcome so don’t hesitate to contact Angus for details. Great Chishill DCC (responsible for the care of St Swithun’s church) is delighted to announce the award of £29,700 from the Heritage Lottery Fund. This first-round funding means that HLF has endorsed the outline proposals and earmarked funding, as well as contributing towards the costs of the initial work. Once we know what restoration work is needed we will submit detailed proposals to HLF in a second-round application later this year. St Swithun’s is an important example of an intact medieval parish church, whose history is strongly linked to that of the village. The church is grade II* listed, reflecting the significance of its architecture and heritage. The tower has suffered various mishaps over the years; it caught fire (affecting the roof and floor under the bells) in the disastrous fire of 1798, when 80% of the village was destroyed. 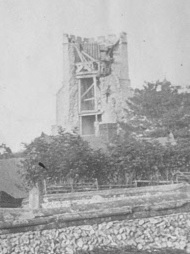 The tower began to crumble badly in 1884 and the top fell off in 1891. It was rebuilt in 1896-7 at a cost of £865, but without the original spire. Now it is suffering serious damage as a result of water penetration through the upper flint walls, especially the East face. 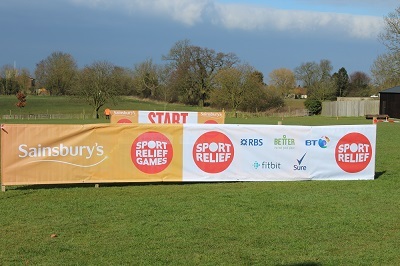 On Sunday 20th March, 140 people turned up from far and wide and took part in the Great Chishill Sport Relief Event. The sun shone, the WI served freshly baked cakes, Wobbly Wayne bought along one of his bouncy castles and we were all set for a great time. Everyone seemed to have a great time, as they walked, ran or ambled either 1, 3 or 6 miles around a scenic Great Chishill route. The final total of funds raised will not be released until June (when the sponsorship pages close), but on the day, and coupled with great events organised by Chishill Chimps and the Youth Club, over £1000 has been raised so far. Thank you all for your tremendous support, you were amazing! Pictures from the event available on ourSport Relief 2016 page. The annual Sloe Gin Competition culiminated in the Tasting & Results Party on Saturday 20th February 8.00pm at Hall Farm by kind invitation of Peter and Jean Wiseman. As usual there was a big turn out and a large number of entries to be sampled! J Cartwright and Fred Kuenzi took 1st and 2nd places in the 'Nouveau' section with Sue Maynard and Mike Livings coming a close joint 3rd. Peter Wiseman took 1st place in the 'Vintage' section with Neil Heywood and Angela Patrick getting joint 2nd and Bob Hatt a close 3rd. In the 'Ringers Delight' category S Kea-Strachan won with 'Sloe Gin Liqueur', Neil came 2nd with his 'Damson Brandy' and C Williams' 'Damson Brandy got the 3rd prize. The now traditional Craft Fair in Great Chishill, took place on Saturday 5th at Lynchetts Farm with kind permission of Tom and Ellie Mead. Local Crafts, Christmas Trees & Wreaths, Christmas Cakes, Hot Dogs & Christmas Baking all went to make a successful day, raising £423 which will be divided evenly between St. Swithuns restoration fund and the Windmill Fund. 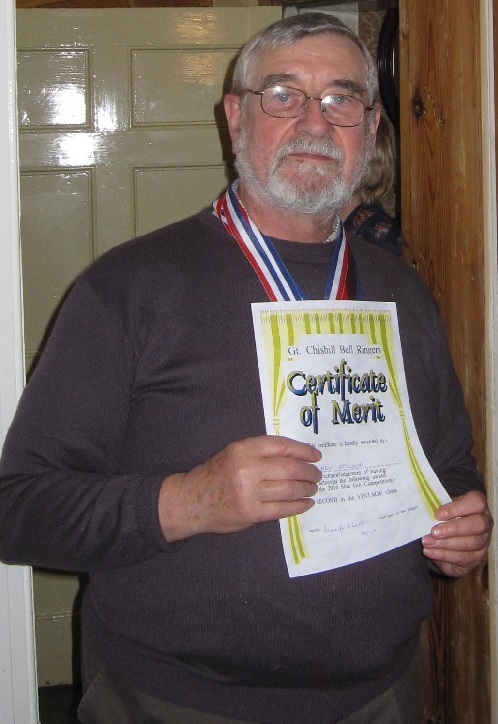 'Heydon Hell Raisers' win Great Chishill’s Musical Quiz Night! Taking the lead by just one point, ‘Heydon Hell Raisers’ beat ‘Team Dog-Minion’ to win the musical quiz night held on October 17th in support of the St Swithun’s Appeal. And there was just one point between 2nd and 3rd place, so a closely fought contest! Masterminded by Maggie Mather, questions covered a wide range of music from Bond themes through voice types to ‘Musical Consequences’. Recorded excerpts were interspersed with performances by Maggie, with Lucy Maynard. This hugely entertaining evening has raised £1,300 towards essential church repairs. St Swithun’s Appeal Committee thanks Maggie and Lucy, the Russells for running the bar, Elaine Knobel-Forbes for running the kitchen and all who kindly helped with cooking, raffle prizes, ticket sales and setting up. A huge and very heartfelt thanks to all who came, enjoyed, supported and contributed to the wonderful evening that raised £9,500 for the church refurbishment appeal fund. We (the organisers) have received many emails and texts and have had many a conversation reflecting on an evening that was enjoyed by so many in our community. We have noted suggested for another time! A directory of our sponsors for the evening is available here. There are some very useful and very unusual contacts for women; hats, bags and scarves, wonderful for all occasions. Excellent hair dressers for men and women, bespoke jewelry (ideal for a gift). Step in Time is highly recommended for anyone who suffers any kind of pain, particularly back, knee, neck and feet problems. 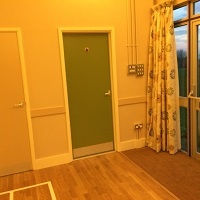 North Norfolk Disabled Holiday homes, idyllic spot for an ideal and easy holiday. Please do take time to have a look you never know what you may find. We were delighted that so many people of all ages came to enjoy the music of Saffron Walden County High Jazz Band, the story teller Gillian McClure, the tea, the BBQ and bar and the activities at the Mad Hatters Tea Party which raised about £1000. Taking the total to over £10,500 raised over the weekend. 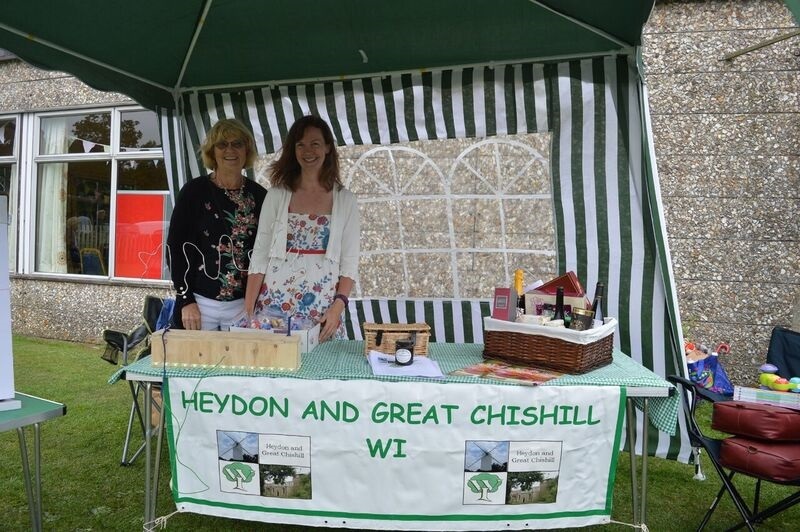 On 13th June the Great Chishill Windmill Trust held a Celebration Day which was attended by around 150 people! The day was packed with a wide range of activities including a dance demonstartion, scone making demonstration and a detailed report on the plans for refurbishing the windmill. Sunday 17th May saw the next in the series of fund raising events for St Swithun’s church refurbishment appeal. 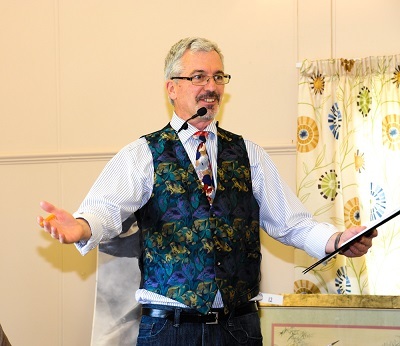 The smell of a BBQ and the promise of a celebrity auctioneer, David Palmer, known for his multi coloured waistcoats, from 'Bargain Hunt' and 'Flog It', mobilised the community with outstanding enthusiasm. From 10.00 there was a torrent-not a steady flow- of people bringing their items for sale and by 12.00 the Village Hall was rammed full of 418 lots, all the sellers hoping that they had found treasures in their sheds. Three wonderfully entertaining hours later all was gone, one man’s rubbish had become one man’s treasure (124 sellers and 98 buyers)! David Palmer had us bidding for our own goods, buying stuff we really did not want, but most importantly, giggling all the way home at the fun and entertainment we had all enjoyed that Sunday afternoon. By the time the final accounts are signed off we will have raised about £1800 for the appeal. A really magnificent community effort. Thank you! I must also thank all of the helpers for all of their wonderful efforts on Sunday as they worked tirelessly all day. I certainly need to rebuild friendships before suggesting the date is booked again for this time next year. Now we have the Midsummer Ball and the Mad Hatters Tea Party on June 20th and 21st to look forward to. Great Chishill Village Hall has been closed for a few weeks for renovation. The works are now complete and the hall was officially re-opened on Friday 10th April. 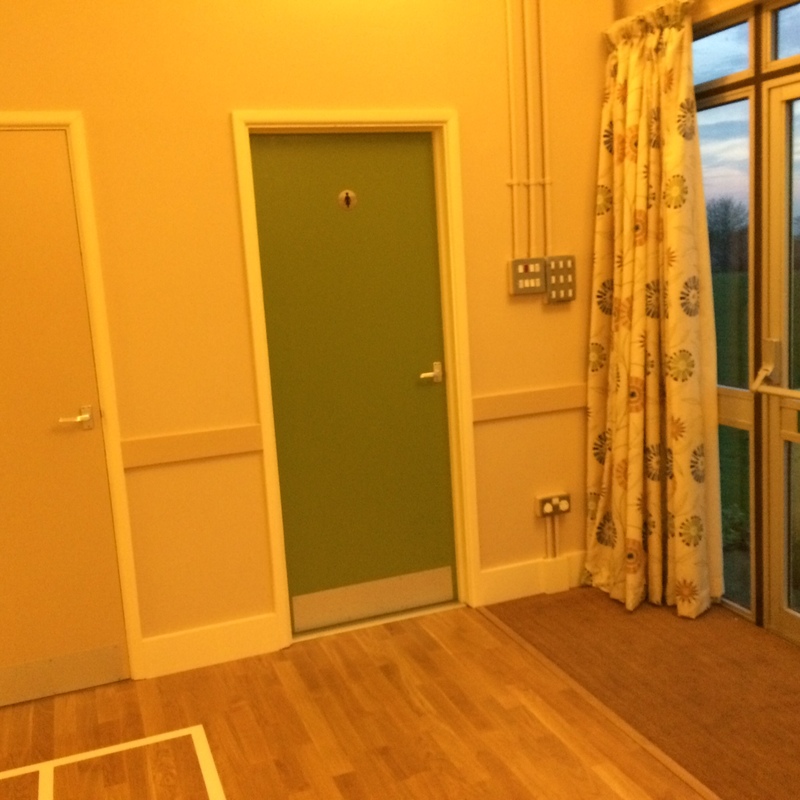 Renovations included the installation of new lights, a new floor and acoustic panels. 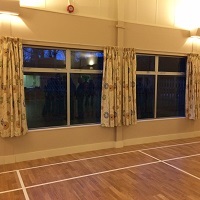 The Hall is available to hire for village and private events. See below for viewing availabiliy and booking details. How times have changed! Elizabeth Allford has sent this in. My mum, Muriel Baker, nee Gunnell, who was a member of this parish all her young life sadly passed away on 30th November 2014 aged 88. She was married in St. Swithins church on 14th May 1951. Sadly, my dad passed away earlier this year, in March. They were happily married for 62 years. She was born and grew up at the Old Bake House Maltings Lane and has many happy memories of village life which she spent her life recounting to us. As she had a deformed left hand with only three fingers, she had to get special permission from the Bishop to wear her wedding ring on her right hand. When she was interviewed to be married, she was almost outraged by the vicar’s question, “Are you entitled to wear white?” Of course she was! How dare he suggest/think otherwise! She was horrified. You may know that the village has had an animal rescue for more than 10 years. However, you may not know that it is now a registered charity and very well known in the 'rabbit' world and more generally for animal welfare. Even the RSPCA ask the rescue for help, recognising the expertise it has. The Rescue even won a national award in 2013, The 'Wetnose Award' for 'Best Small Furry Rescue' of the year! The Rabbit Residence Rescue is run by Caroline Collings, her assistant Amy, numerous volunteers and overseen by a team of trustees. The Rescue cares for rabbits that have been neglected, abandoned, are unwanted or that owners can no longer afford. The rabbits are treated medically and rehabilitated as necessary, and are then re-homed to suitable new owners. All rabbits are neutered and vaccinated before re-homing and new homes are vetted. 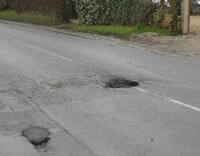 If you come across a pothole which you think is dangerous, please report it to the Police using the 101 number. 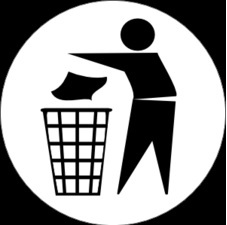 To report Fly Tipping you can use This link. Bellringing is good for you! You can now contact Cambridgeshire Constabulary on 101 for all non-emergency calls. The 0345 456 456 4 number will remain in use alongside 101 for several months to allow people time to get used to the new number. The change comes part of a national programme to make 101 the single non-emergency number in England and Wales, giving residents an easy-to-remember number to contact local police wherever they are. The call system is designed to recognise where you are calling from and connect you with the local police service. If you did not want to speak to your local force, or the force area you are in, you will be given the option to be connected to different one. The number change does not affect the way that calls are handled and we will continue to take non-emergency calls 24 hours a day, seven days a week. Please continue to call 999 when an immediate response is needed because a crime is happening, someone suspected of a crime is nearby, or someone is in danger. Inevitably there is a wide range of opinion on what should and should not be done. If you have a comment to make on the subject, click on the 'Have your say' button and have your opinions published on this site. See what has been said so far. Read a fascinating history of the windmill, its role in the village over the years, and the people who owned and worked in it. Need a lift? You can call on us! Royston and District Community Transport offers door-to-door transport for people living in Royston and surrounding villages. The scheme is aimed at groups or individuals who are unable to use conventional public transport for reasons of age, frailty, impaired mobility or the lack of public transport, and who do not have the use of a car. Our volunteer drivers use their own cars to help transport people to hospitals, doctors and other medical and social appointments. Our minibus and MPV are suitable for wheelchair users who cannot transfer to a car. Pru Burton, our co-ordinator, will be happy to help you get to where you need to go. Passengers pay 50p per mile direct to the volunteer car driver, with a minimum charge of £4-50 for journeys of up to nine miles. The scheme requires 48 hours’ notice for journeys, but will always try to help in an emergency. RDCT would also be delighted to hear from any car drivers in and around Great Chishill who are able to give a few hours a week to help the community. Royston & District Community Transport is a registered charity, based at Royston Hospital, and can be contacted on (01763) 245228 between 9am and 3pm, Monday-Friday. On Sunday 7th October, around 100 people armed with metal detectors, led by Zoë Williams of Pink Wellies Metal Detecting Group set out to search 250 acres of land surrounding the windmill by special permission of the landowners. Zoë impressed upon the detectorists that they should leave no holes, hollows or mounds when they dug, leaving the ground as they had found it. 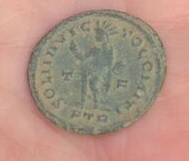 Within 3 minutes a Roman coin had been unearthed. 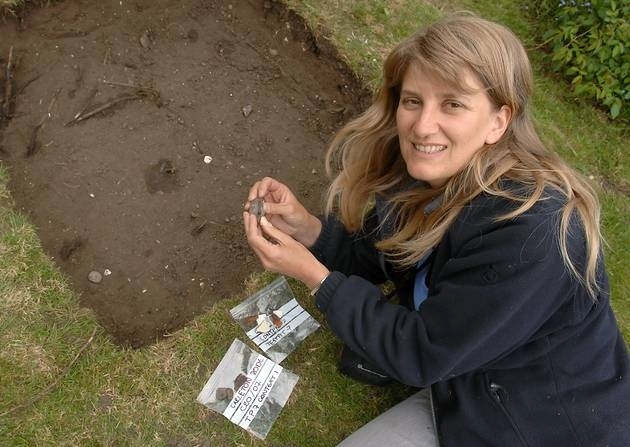 This was only the start - during the day plenty more Roman and Mediaevel coins were discovered. 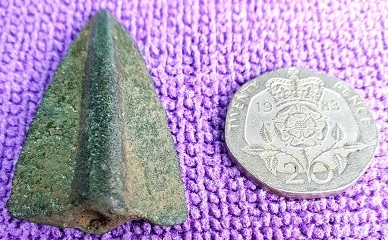 Coins were not the only things discovered - the most striking find of the morning being a near perfectly preserved bronze-age spear tip or arrow head. Quite a few bronze age artifacts were found and although we can't say that there was a village or dwellings here it shows the area was well used in the period 1200 – 4000BC. 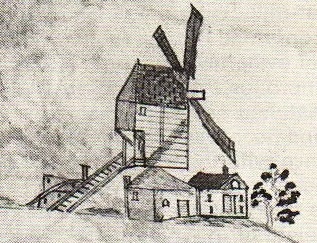 Of more direct relevance to the windmill was a lead weight. Shield-shaped weights of this type are described by the British Museum as mediaeval trade weights used in the early days (1200 – 1600AD) of the standard weight system of pounds and ounces (avoirdupois). The photograph shows that this one has a windmill stamped into it so we guess it was specifically for grain or flour. 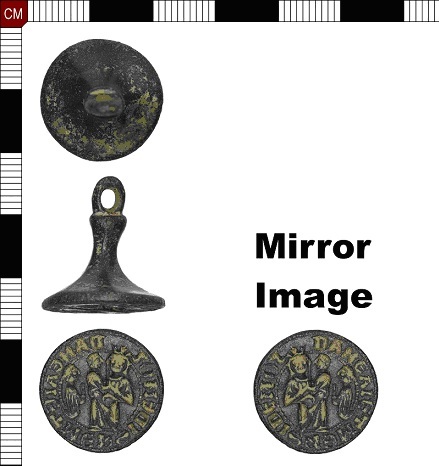 A lovely seal matrix from the 14th century was also found which warranted registration with the official finds office. By 5 o’clock, most folk had dragged their weary bodies from the fields but all expressed their pleasure at detecting in such wonderful countryside and on such a perfect day. To add to this satisfaction came the news that they had collected over £1500 for the windmill. This will go a long way to paying for the annual maintenance so we are truly grateful to all who took part in this alternative style of fundraising event. The Windmill Club is a Cycling UK affiliated group. 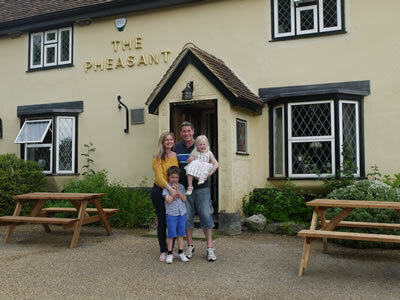 The club is based at The Pheasant. Rides take place twice a week - approx. 20/25 miles on a Monday afternoon/evening and approx. 30/45 miles on Thursday mornings, usually in the lovely quiet lanes surrounding this area. During the summer months rides sometimes start at locations in Suffolk or Norfolk and take in places such as Aldeburgh, Southwold or Wells. The pace is leisurely and there is as much focus on good companionship, conversation and coffee/pub stops as there is on cycling. Each ride costs £3.00 and the proceeds are donated to various charities at the end of each year. So far, over £5,000 has been raised. 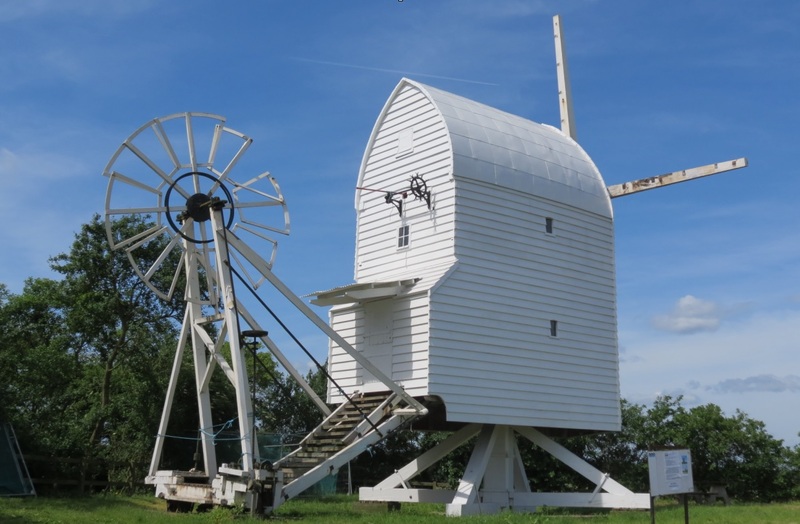 For more details of The Windmill Club's rides please take a look at their blog. Heydon Parish Council have issued the following statement. South Cambridgeshire District Council has received a 'pre-application proposal' from the owner of Heydon Estate, to give an initial view on the possibility of a major development around the village, that could include about 9000 new dwellings. At the moment there is no planning application. The land involved would be the fields on the right and left hand sides going down Fowlmere Road from Heydon, and a large swathe of land on the left hand side, around the golf course and stretching across to the Barley Road, and some land on the other side of the A505. The Parish Council have received a letter from a company called Waldon who are proposing a telephone mast on Hall Lane and given until 20th June for comments! The Parish Council discussed this at their regular meeting on 21st June. See the PC website for more information. (www.greatchishillPC.com)send any comments to clerk@greatchishillpc.com or email the company directly. Letter to PC and Details. June 10th started out overcast but as 2pm approached the skies cleared giving way to a glorious afternoon and evening - perfect for the Open Gardens afternoon. This was the fifth time that this biennial event has been held, raising money for St Swithun's Church. 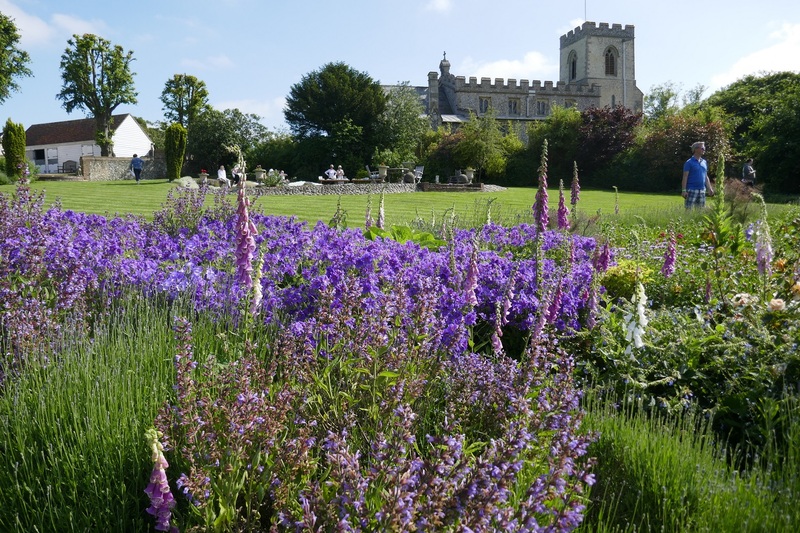 The church was the starting point where for £5 visitors were given a green wrist band so that they could visit any of the 8 gardens open for viewing in the village. Teas were available at Rectory Farmhouse, ice creams and other delights at the URC schoolroom and Indian nibbles served at the Rectory. The event raised £840. Click here to see pictures from the day. 9.45pm, July 25th, The Pheasant garden. The sound started from over near Bull Meadow, got closer and closer and continued away towards Reeves Pightle. At the same time a largish bird flew over. A quick visit to the web confirmed our suspicion. Yes - it was a Nightjar! 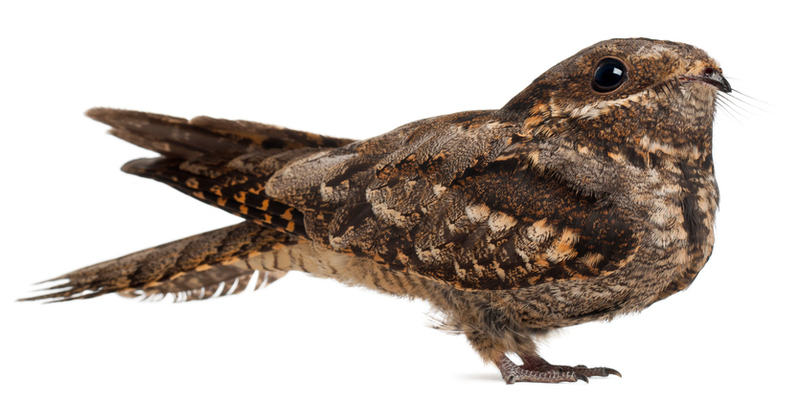 Nightjars are nocturnal and are out looking for food - moths and beetles - at dawn and dusk. They are similar in size and shape to a cuckoo or kestrel. They are migrants, arriving April/May time and leaving in August. They are on the RSPB amber conservation list and are not normally found in this area - Thetford Forest being the nearest known habitat. As part of the continuing fund raising for the restoration of St Swithuns, Great Chishill resident Lisa Mackenzie organised for the choir of which she was, and sometimes still is, a member to come to our village and give us a wonderful concert of sacred music. Led by their conductor Alex Patterson they gave a mix of pieces without any accompaniment. 'Wow' was probably the word most used by the audience who were held spellbound for the whole evening. The concert was helped along by drinks and nibbles, and a competition to guess how far the choir had travelled in 5 years. As yet we do not know how much was raised towards the restoration, but thanks go to everyone who had anything to do with the event. 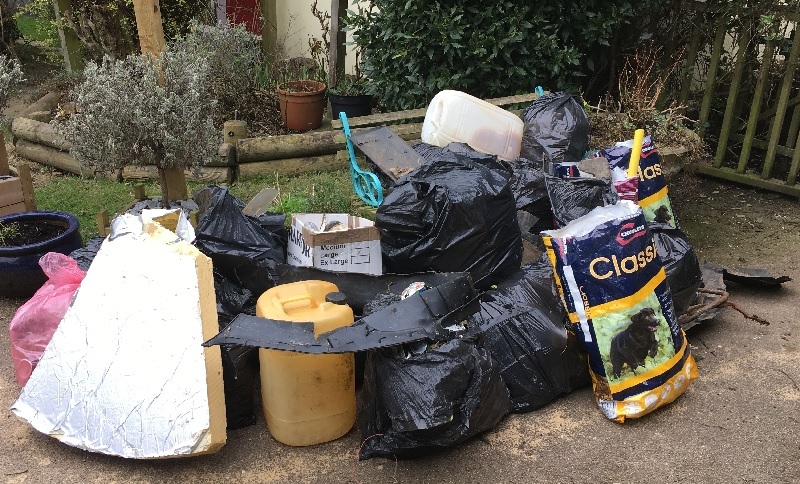 On Sunday March 25th (2018) a band of a dozen or so turned up at the URC to do something about the rubbish that is dumped in our highways and byways. Organised by Tess and Angus Gent, the URC supplied gloves, rubbish bags and litter pickup tools. In a couple of hours an enormous quantity of rubbish was collected, some on which is shown in this picture. Apart from bits of cars there was a very large number of glass and plastic bottles and aluminium drinks cans. Back at the URC a lovely tea had been laid on which helped to make it worth doing. 85 guests from far and wide attended the Little Chishill Church Burns Night celebrations in Great Chishill Village Hall on Friday 26th January 2018. The organisers would like to extend their sincere thanks to all the volunteers who helped before and during the evening; also, to Peter Pirie, who held us all spellbound, with his inspired renditions of a Toast to the Haggis and Tam O’Shanter. Following some enthusiastic dancing to Jump the Vortex, the event closed with the time-honoured rendition of Auld Lang Syne. With some generous donations, the evening raised £2,000 for Little Chishill Church Fabric Fund and a big thank you goes to all who supported the evening. Inspection of the timbers of the mill has revealed both good and bad news. The main supporting timbers (side girts) are less rotted than feared and, with simple steel straps and plates across a couple of cracks, should last at least another 100 years. The corner upright posts have all suffered quite badly with the constant ingress of water and all need attention. It looks, though, that we will not need to replace them as the millwright has a plan to cut 50mm from their outer faces and ‘plate’ them with new green oak to give the required strength and surface on which to attach the new weatherboards. What was not expected and is the cause of significant extra work was the condition of the main horizontal weather beam that supports the wind shaft holding the sails. So much rot has occurred at its ends that it is no longer securely attached to the corner posts and has tilted forward under the weight of the sails. The sails have had to be removed, the wind shaft propped up and the weather beam removed. The repair to the weather beam will require the addition of a steel joist to give real strength to the structure. The unexpected damage has pushed the total repair estimate up to £118,000 but having granted the project £15,729 towards costs before discovery of the extra work, Historic England’s funding committee reconsidered the position and agreed to increase the grant to around 70% of the requirement. 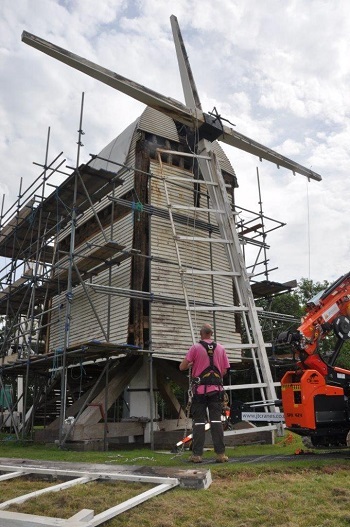 Together with the Sponsor a Board money, other grants and contributions, there is now have sufficient to complete the structural repairs and make the mill weatherproof once more. This will remove it from Historic England’s 'Heritage at Risk’ listing and return it to its position as a public attraction. 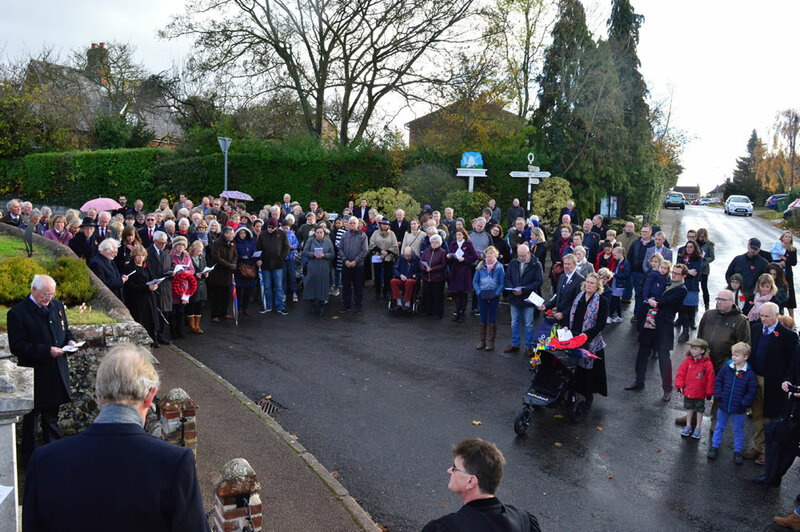 On Sunday 14th October, and quite co-incidentally the morning after archaeologist Carenza lewis' talk on local history, 51 keen metal ‘detectorists’ of the East Coast Searchers group gathered on Tom Duke’s field on the Little Chishill Road to see what evidence they could find of our predecessors. Klaine Feagan is currently working on the repair of our windmill and came up with the idea of bringing his colleagues to see what they could unearth that would add detail to Chishill’s long and varied history. 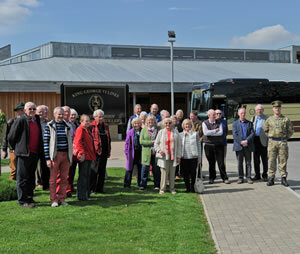 The group is based around Manningtree though one couple had travelled from Padstow, Cornwall to join in! Tom kindly agreed to them using his 40-acre field, the sun shone and everyone had a grand time. At the end of the day, Sue Clark, Chair of the East Coast Searchers, said that it had been a very productive and enjoyable event. As well as ancient buckles, clasps, musket balls, spinning weights and buttons, a well-preserved wax seal stamp was found. Coins were also numerous, including a fine looking Roman piece thought to be from the reign of Constantius II – AD 337 to 361. The group kindly donated some of their finds to the Windmill Trust for display in the mill. They, and Tom Duke, generously waived all expenses and charges donating all proceeds to the windmill restoration – a magnificent £792.50! 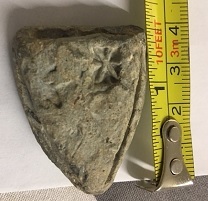 Pictures of finds and of the day. A couple of years of hard work organising fund raising events, filling in forms, producing policy documents, and plans for community involvement etc has paid off! The DCC have been awarded £196k of National Lottery support to carry out the urgent repairs to the church tower. A smaller grant in March 2016 was used to investigate the cause of water penetration, which has plagued the tower for many years damaging the fabric of the mediaeval tower arch which is now crumbling badly. Following this work will start towards the end of August raking out the tower flint work on all elevations, re-pointing with hot lime mortar, consolidating the fabric, improving water shedding from the tower, removing internal plaster and providing better ventilation to help the tower dry out. The project has also been given funding to install basic facilities, an accessible toilet in the tower together with a water supply and drainage. This wonderful and much loved building will then be more useful to the wider community for meetings and events. 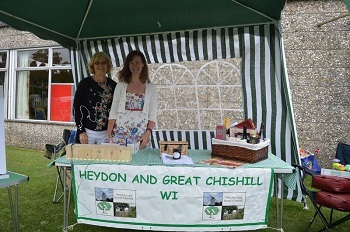 On Saturday 15th July the Chishills' annual fete was held on the playing field in Great Chishill. A warm but not so sunny afternoon brought out the villagers for fun and games, competitions, face painting, tractor rides, Bar-B-Q and of course tea and cakes! Neil was there with his camera and you can see more of his pictures from the event by clicking here. Clicking on any picture will load a bigger version. Liz Parkes writes 'Many thanks to everyone who entered the Annual Heydon & Great Chishill WI Fete Quiz. Over 100 people took part and of the completed entries received back, 3 people got 100% of the answers correct. Congratulations to: Andrew Drury, Lisa Mackenzie and Philip Gough. On 3rd May (2017) ownership of The Pheasant passed over to the Wickens family. Debbie (Debs) and Mark became the new licensees and moved into the flat above with their two children Joshua aged 6, Evalyn aged 3, and Louis the dog. The family have moved here from Potters Bar. Mark, had to give up his previous job as a builder due to a knee injury and saw The Pheasant as an opportunity to start a new career and move to the countryside. Debs was a 'stay at home mum', a role that she still plays as well as being a full time landlady! Initially they intend to keep things pretty much as they were, but to gradually put their own stamp on the pub. The first change has been the removal of the 'no children' policy so that families will feel more welcomed. In the longer term there are plans to extend the pub and relocate some of the facilities like the dart board. Mark is very keen that the 'pub is the hub' in the village and that everyone will feel at home there. Food is now being served 7 days a week (except Sunday evening). Steve Lemon - the very popular chef who used to work at the Pheasant with the previous owners HAS RETURNED and launched an exciting new menu! On Friday 21st April the village hall was filled the music of the Cambridge University Ceilidh Band. These very talented musicians and their superb 'caller' had people up and dancing all evening. It was truly amazing the way that people were able to dance dances that they had never even heard of before after just a few minutes of 'run through'. A lovely Coronation Chicken supper followed by Chocolate Brownies further helped the proceedings. 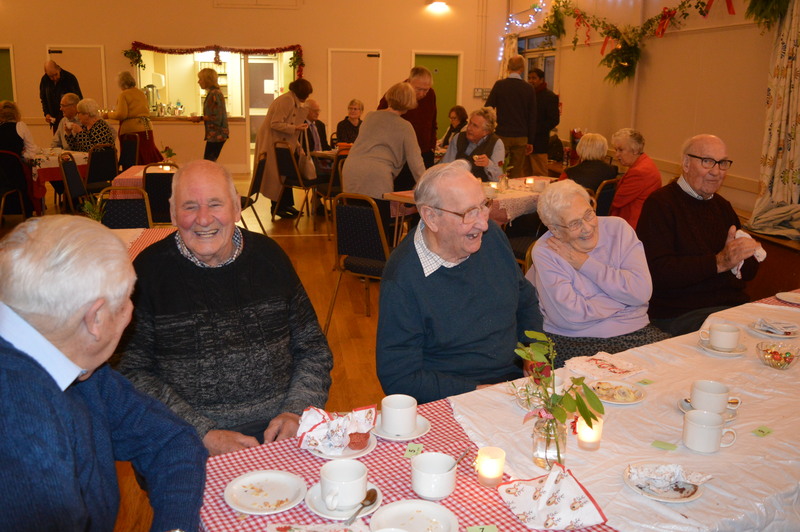 There was a licensed bar, a raffle and 'heads and tails' and the whole event raised in excess of £1100 for the St Swithuns restoration appeal. The auction was another fantastic fundraising event, with a great deal of quality goods and some with interesting provenance; a deck chair from the Titanic, in a round about way... a car, a dress sword, a tuck box used by the prefect who had Jeremy Paxman as his "fag" and plenty of other weird and wonderful objects!! All in all another really entertaining and successful day. Angus would like to thank all of the wonderful people who helped raise over £1000 for the church appeal. This year sees Tracey Greeman take on another challenge for the Breast cancer charity 'Walk the Walk'. This year it will be the Berlin Marathon in September, as well as volunteering on the night of this year's London Moonwalk. Tracey has been raising money for this charity since 2010 and has surpassed £13750 and hopes to exceed £15000 by the end of this year. On February 6th at around 1115 this unusual meterological phenomenom was seen immediately above Great Chishill. According to our weatherman contact it is called a circumzenithal arc (CZA). CZAs are formed when sunlight refracts through horizontal ice crystals at such an angle that the light enters the crystal through its flat top face and exits through a side prism face causing the distinctive upside-down rainbow effect. They are commonly associated with Cirrus clouds where ice crystals readily form. 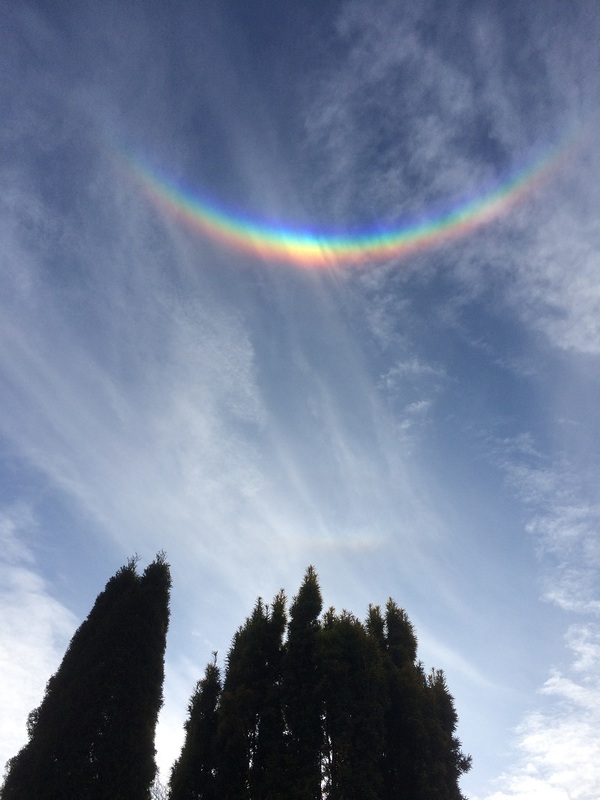 In order to be able to see a circumzenithal arc, a combination of atmospheric conditions must coincide just right. The height, depth and position of the ice clouds must be right as the cloud needs to be at a specific angle convex to the sun. The position of the observer is also important since its visibility can vary greatly over short distances. The year 2016 turned into a momentous one for the windmill - on December 14 the Trust was granted Listed Building Consent (LBC). This is key to taking active steps to bring the structure to a stable and weatherproof state for its long-term preservation. The state of the trestle upon which the whole structure depends is of primary concern. Millwrights have been commissioned to construct and fit restraining irons and plans are in hand to repair, protect and paint the woodwork after which we can perhaps relax a little during winter storms. At present, the whole mill moves sufficiently to give concern that it could rock itself off the supports and collapse. The LBC also covers removing weatherboards covering the main side supporting timbers (the side girts) that are known to have damage and rot. This will involve erecting scaffolding which may be extended to the roofline so that the lost weatherboards can be replaced and the tarpaulin permanently removed. Another major turning point was active encouragement from Historic England. The Head of the Buildings at Risk section and his Senior Surveyor met with the Trust on December 21 and gave very encouraging advice on seeking funding from the Heritage Lottery Fund (Resilient Heritage grants) and the Architectural Heritage Fund (Project Development grants). These specifically address the problems that charities have in creating a broad-based committee structure and a working method connecting with the community and education needs of the district. The major grant funders do not consider preservation of the structure itself a charitable cause in its own right - the heritage site must take a meaningful place in the education and recreation of the community. The Trust therefore seeks to engage actively with schools, community groups and parish activities to create a self-sufficient amenity for the benefit of all. 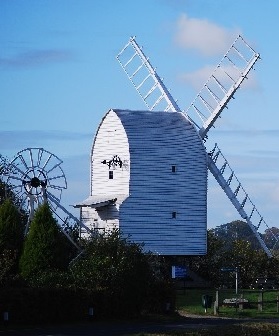 The Great Chishill Windmill Trust has a lease on the mill until 2139. Clearly, laying the foundation of an organisation with the necessary objectives and such an horizon is no mean feat. We need more people to join the committee to take it into this next phase - people with good ideas who are prepared to give a little of their time to establish strong courses of action. In particular, we are looking for those who could help build links to schools and the National Curriculum; anyone who could liaise with funding organisations; and someone to oversee the actual work programme. If you think you could help, in whatever way, to make this fabulous piece of our rural past an active amenity for the local community please contact the Secretary of the Trust - David McKeown, 838087 or dm@greatchishillwindmill.com, who would be pleased to explain further. 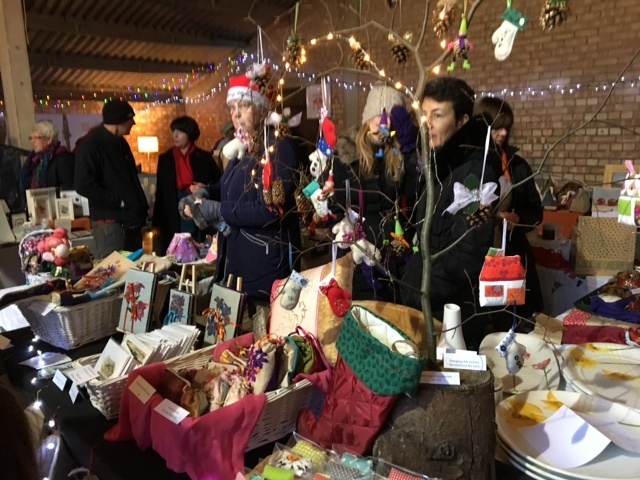 The popular Craft Fair was held at Lynchets Farm in New Road on 3rd December. This was again a very successful event - great atmosphere, and lots of people came from the village and afar. £676 was raised for the church and the windmill. Thank you to Tom and Ellie Mead for the use of the barn at Lynchetts Farm. Father Christmas, Noah the Donkey and the Hand Bell ringers helped create a lovely Christmas feeling. The annual Service of Remembrance took place on Sunday 13th November and was well attended, with nearly 100 people turning out. 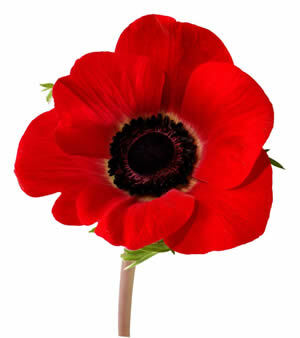 The service was led by Simon Bailey who is Chaplain to British Horseracing, and the Last Post was sounded by Stefan Butlin. 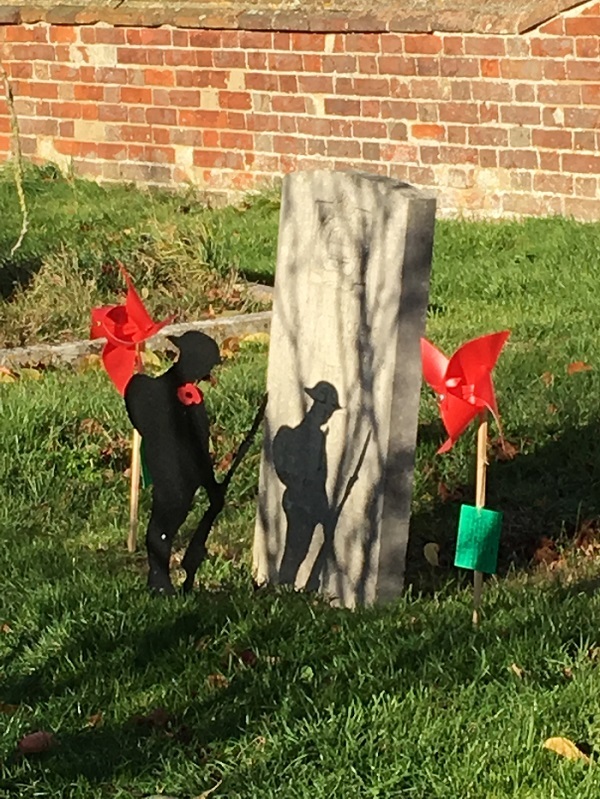 This remembrance was particularly poignant as it was the 100th anniversary of the Battle of the Somme in which 4 young Great Chishill men died. Photos © Neil Heywood Click on pictures for larger version. 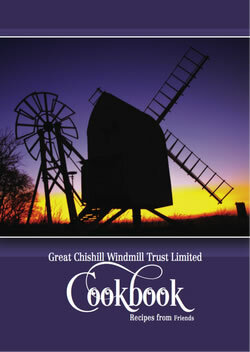 The cookbook containing 52 recipes submitted by the Chishills residents and friends is now available to buy at the modest price of £7.50, with proceeds going to the Windmill Restoration Fund. August Bank Holiday weekend saw two events in Great Chishill - the first the wedding of Fiona Russell to David Hall - Congratulations. The reception was held in a marquee at May Street Farm by kind permission of Pamela and Terry Ingles. 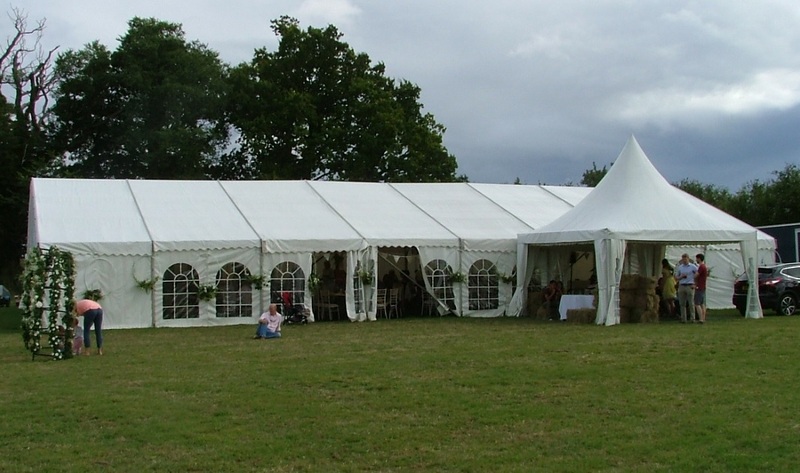 Fiona's parents, Stella and Nigel generously allowed the use of the marquee the next day for a fund raising event for St Swithuns Church. The event was billed as 'Having a Laugh' and consisted of an afternoon of entertainment by comedy duo Danny Platton and Pat Nearney. 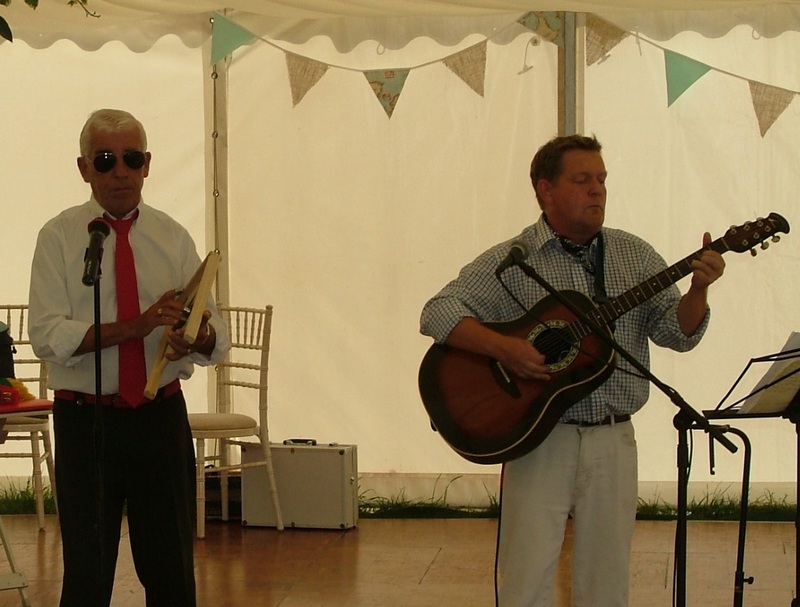 More than 100 people were entertained all afternoon by this very talented couple who sang, played guitar and washboard, reminding us of many of the 'old songs' - 'My old man's a dustman', 'Wild Rover', 'Black Velvet Band' etc. There was some stand up comedy - jokes mainly based around Norfolk (with accent to match), and some very funny mime. A splended lunch of pulled pork burgers with all the trimmings (crackling, stuffing, apple sauce etc) followed by apple crumble and custard, was included in the ticket price - well done to all involved. It was a lovely sunny day and a good opportunity for a village 'get together for a good cause. The event raised a total of £1085 for the church restoration fund and a further £100 was raised for the Teenage Cancer Trust as a 'thank you' for the use of the field. From chandeliers and chaises longue; rocking horses, pedal cars and bicycles to garden furniture, golf sets, guitars and a croquet set, the St Swithun’s Appeal ‘Good Old Fashioned Auction’ had something for everyone. 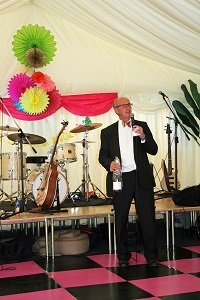 TV auctioneer, David Palmer, rattled through over 300 lots to help raise £2,000!! This brings the Appeal Fund to within about £5,000 of the £50,000 2 year target set in December 2014. The Appeal Committee would like to thank everyone who contributed by selling, buying, making tea and cakes, portering, clerking, barbequing and more, to make a successful village event. 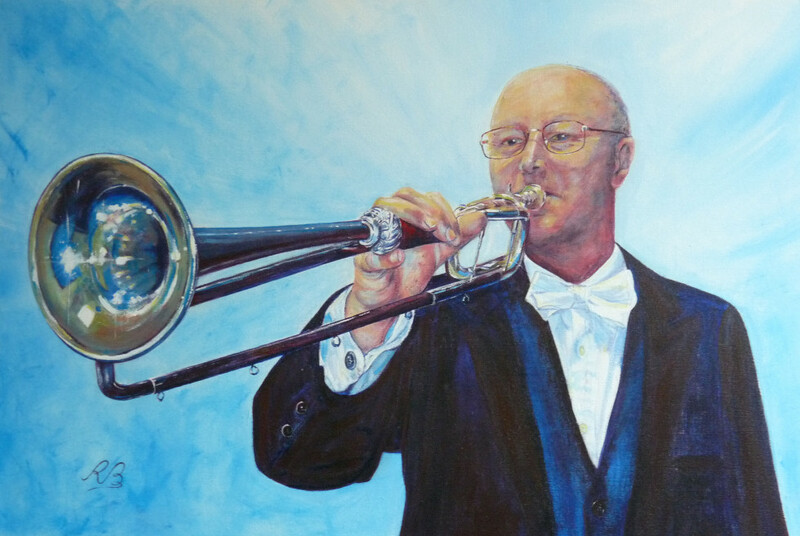 Audiences the world over have enjoyed Crispian Steele-Perkins’ trumpet performances. He’s played the Royal Albert Hall, Sydney Opera House, New York’s Carnegie Hall and now, St Swithun’s Church Great Chishill! An audience of 150 packed the church on Friday April 15th to enjoy this concert generously sponsored by two local people in which Crispian was accompanied by talented local organist Richard Carr. 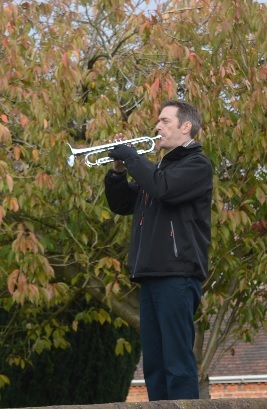 As well as winning new fans for trumpet music, around £2,500 was raised for the St Swithun’s Appeal Fund, taking funds raised so far to over £41,000. St Swithun’s is on the English Heritage ‘At Risk’ register, in urgent need of structural repairs. Six months of lessons were put to the test on Friday March 18th when the Group held its first dance in the village hall. All passed with flying colours – in fact one experienced dancer said that she could not identify any obvious beginners! Wendy and David, the teachers of the Group, opened the dance to villagers and others and 34 dancers arrived to enjoy the event. Ballroom and Latin dances were played throughout the evening so having sped round the floor with a quickstep, dancers could catch their breath with a rumba. Waltz and jive were particularly popular. A good time was had by all, one villager remarking that it was refreshing to attend a dance without having disco music blasting at you. People gave generously to the Trust contributions box and we were able to announce at the end of the night that the whole dance lessons initiative had made £1000 for the fund. There was also a raffle for St Clare Hospice where Wendy and David’s teacher, Peter Sturt, had recently died. We are sure that he would have been proud to see many of his former pupils and those taught by former pupils dancing the night away. 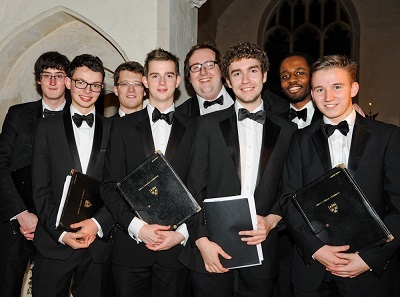 The music scholars of Kings College Cambridge - the 'Kings Men' - delivered a splendid concert in St Swithuns on Sunday 6th December. The programme consisted of a mix of secular and sacred music, sung to a packed church. There was plenty of refreshments available as well which all went to make a most enjoyable evening. The church had its 5 yearly architech's inspection last August and at an open meeting in St Swithun's church on 30th June the full extent of his report was revealed. For hundreds of years the church has stood as a local landmark and the centre of the community. It has withstood attacks upon it by Oliver Cromwell, a devastating village fire and the collapse of its tower, but now it is falling into disrepair due to the ravages of time. The architect's report calculates that around £200,000 needs to be spent on it in the next 5 years. Your can see the presentation and how you can help by clicking here. Suggestions and offers of help welcome! On Friday 12th September, the Police were in the village and 29 out of 79 drivers discovered that this is the possible reward for driving through Great Chishill at more than 35 miles an hour. One of them was determined to achieve both results and maybe more, by doing 50mph. Cambridgeshire Police WILL be back with more rewards soon - you have been warned! 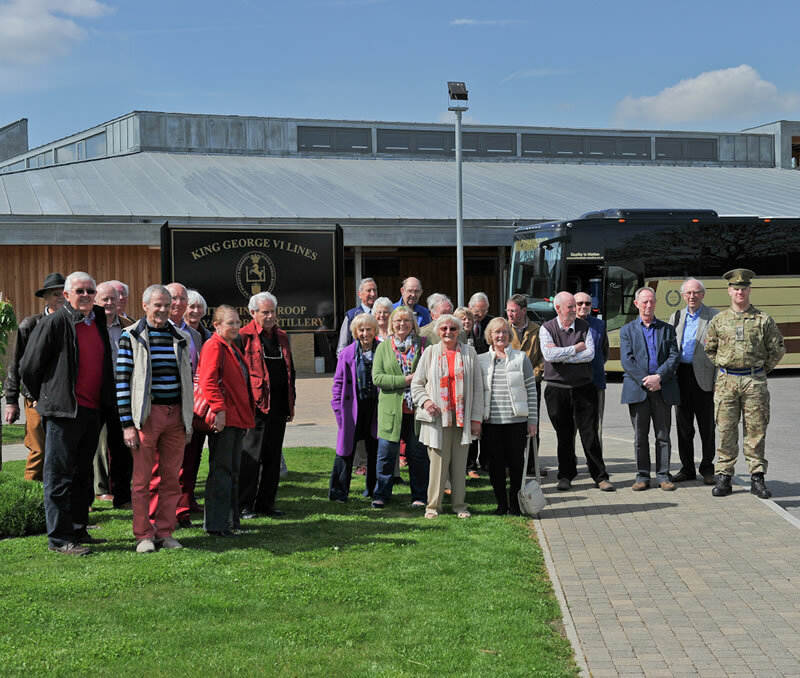 The 'Youth Club' (men over 50 who are in the village on a Tuesday) and their wives, visited the Kings Troop on 10th April. The King’s Troop Royal Horse Artillery is primarily a ceremonial unit of the British Army, quartered at Woolwich. It is a mounted unit and all of its soldiers are trained to care for and drive teams of six horses pulling each of six First World War-era 13-pounder field guns used today to fire salutes on state occasions. Answer - STEALING HEATING OIL! This photo was taken at 3.30am on 26th August, in our neighbourhood. If you know him - call the police on 101. A lesson here for all of us - your oil tank is a target for thieves. It appears that the method is to take it in large can fulls so you may not even notice it has gone, but look out for spillages and a strong smell of oil. Be Vigilant and if you think a crime is being committed call 999. On Saturday 10th March a group of visiting bellringers successfully rang a peal in St Swithuns. 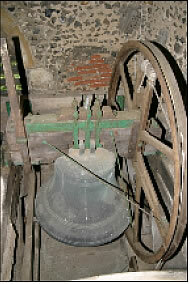 The ringing of bells has for centuries been a way of not only calling people to church but to ring out in celebration. It was a happy coincidence that this peal happened as churchwarden Janet Crouch and her husband Brian celebrated their Golden Wedding anniversary, Jean Wiseman had a 'significant' birthday, and Claire Maynard celebrated her engagement. Ringing a peal is not an easy thing to do. It involves ringing the bells in different orders on each round of 5 rings (in our case) 5040 times! (factorial 7 for those of you mathematically minded). Not only does that involve a lot of concentration and energy but it took 3 hours to complete. The bells of St Swithuns are very old (4 of them cast around 1640) and not easy to ring so it proved to be quite a challenge. Ringing peals at St Swithuns is a very rare event - in fact records show that it has only happened twice before - in 1913 and 2004. 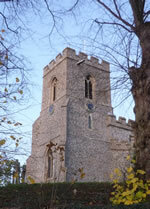 For more about bellringing in Great Chishill visit the bellringing page. Speed in Gt Chishill - and pay the price! On 6th January, 4 drivers received endorsements and fixed penalty notices for speeding in Hall Lane. This was in just an hour. All four were doing less than 40mph. Three other people were cautioned. So, if you speed in Great Chishill, be prepared to pay the penalty. 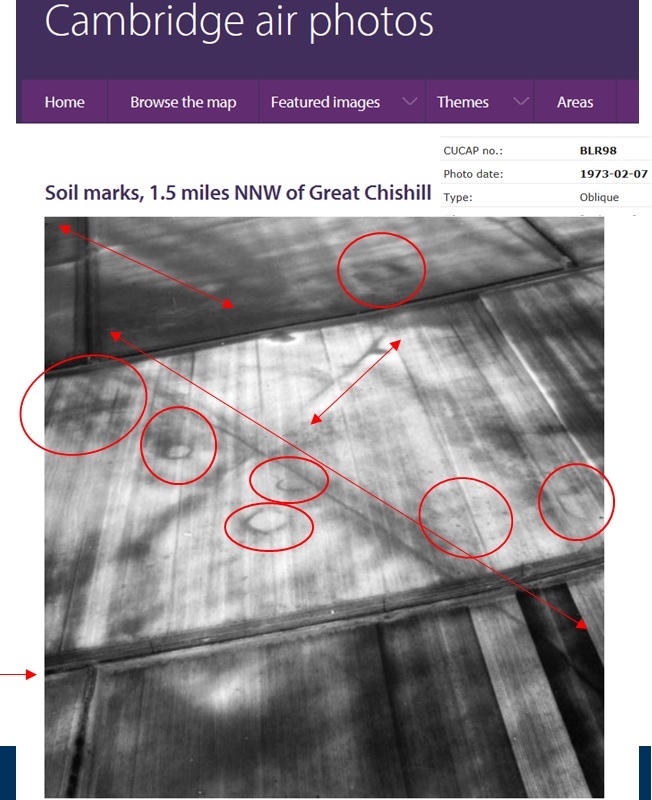 Following an email from Australia from a descendent of a Little Chishill family, we have created a new feature - 'Connections'. This will be where information about anyone who is connected with the Chishills and nearby villages but has moved away can publish their information - linking up with their past, and who knows, reconnecting with long lost relatives and friends. Click on the picture to go to the 'Connections' page. The Trading Standards pages of the County Council website provide information about how to get advice on consumer issues and how to report concerns; it provides advice on the most common problems reported including scams and rogue traders, and tells residents about the issues they are currently tackling. The pages include links to their most recent articles to help avoid the problems that residents are encountering. Currently, these include 'Issues with second hand car sales', 'Domestic appliances and electrical equipment', 'Home security alarm sales', 'Scams' - including the computer virus scam (see below), 'Under-age drinking' etc. There is also a business section which provides information on how to seek business advice on trading law issues which might be relevant to small businesses operating locally. Business pages. The Computer Virus Scam. Many people in the area have received phone calls from companies claiming to have been monitoring their computers and have detected viruses. This is a scam. Trading Standards have issued a press release about this and what to do about it. 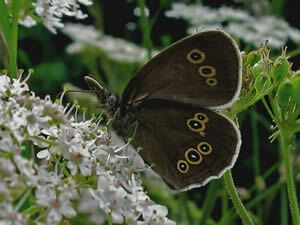 If you thought that a ringlet was something you did to your hair, see what Jack Harrison has to tell us about the butterflies that we may see around our villages. 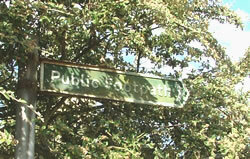 Our Footpath Officer would like to remind or inform everyone who has property which borders a footpath/bridleway/byway that it is their responsibilty to keep their hedges cut so that they do not restrict the passage of walkers, horse riders or, in the case of the byway, vehicles. How often do you throw things away that you are sure 'someone could make use of'? I discovered recently that it is very easy to find a home for things that I don't want or need anymore. By signing up to the local branch of 'Freecycle' you can find a home for almost anything. I recently gave away my old kitchen units, kitchen worktop, and even a dishwasher which had broken down! (The recipient knew that it didn't work). Isn't that better than hiring a skip or taking things to the dump? You simply create a message saying what you have to give away (and it must be GIVEN away) and sit back and wait for emails from people who might be interested. To find out more visit the local website. There are branches at Letchworth and Stevenage too.